At least not for what landscapers want to pay. Most American homeowners are possessive and protective of their lawns, but they are less picky about who maintains them: One in three Americans who have lawns say they hired landscapers to maintain their yards in the past year. The national obsession with manicured lawns has helped propel landscaping into a $76-billion industry that has grown about 3 percent each year. Whether it means finding the right fertilizer or bagging up stray leaves, Americans are willing to shell out about $600 a year for someone else to handle their outdoor maintenance. 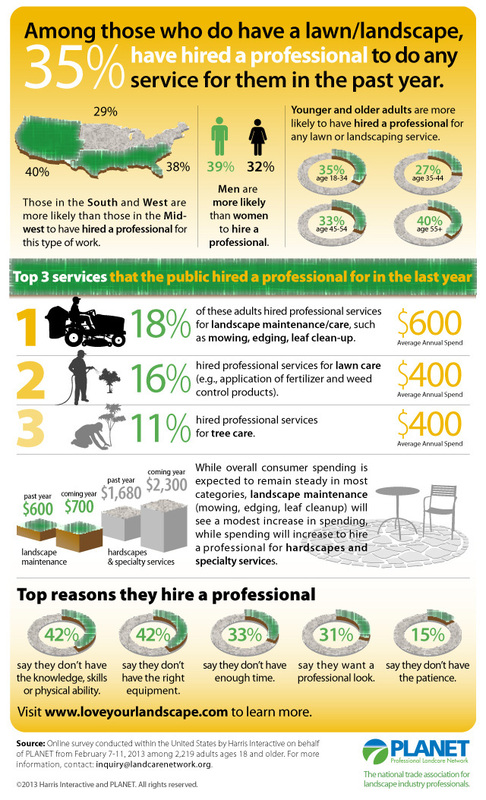 But finding people willing to do yard work is getting harder and harder for professional landscapers. Owners of landscaping businesses are saying that their biggest challenge is finding people who will prune bushes in the middle of the summer, in the heat, for the wages they pay. So it's no wonder, then, that the landscaping industry has become the largest employer of foreign, non-agricultural guest workers. “It's the very nature of the work. The guest workers who come over year after year are willing to put in the hours and difficult labor,” says Paul Mendelsohn, the vice president of government relations for the National Association of Landscape Professionals, a trade group. About 500 or 600 of the association’s roughly 2,500 member businesses use the H-2B visa program, which allows employers seeking seasonal help to bring foreign workers from abroad for up to 10 months at a time (and which is not to be confused with the more well-known H-2A program for agricultural workers). The NALP and other business groups have advocated for increasing the size of the program, which has a cap of 66,000 visas each year. Last year, Congress passed a spending bill that expanded the H-2B program so that it doesn’t count returning guest workers against the 66,000-visa limit. This expansion could add up to four times as many guest workers to the American workforce this year, and the fight to renew the provision, which expires in October, is underway again. Under the H-2B visa, employers must pay travel costs, visa fees, and housing expenses for workers during their stay in the United States. In 2014, most H-2B workers came from Mexico, with Jamaica and Guatemala sending many as well. Texas is the state that brings in the most H-2B workers. Because it involves bringing in foreign workers, the H-2B program has drawn the ire of organized labor. The U.S. Chamber of Commerce has repeatedly told Congress that there aren’t enough Americans willing to take temporary jobs—at amusement parks, ski resorts, hotels—but unions say that’s just not true, and that companies are trying to save money on labor costs by exploiting cheap foreign workers at the expense of Americans. In June, representatives from North America’s Building Trades Unions said in a Senate hearing that the program is just a tool for roofing companies to pay $8 an hour to a foreigner instead of $22 an hour to a union member. The Southern Poverty Law Center has even gone as far as comparing the guest-worker programs to modern-day slavery. Yet there is hardly any independent research on how temporary workers affect the demand for American labor. After scanning the Department of Labor’s online database of recent requests for H-2B workers, and talking to people who use the program, it’s hard to imagine that any business would go through such a bureaucratic, expensive hassle unless they truly had a shortage of willing workers. Sure, I came across a few businesses that appeared to be looking for a bargain, but the vast majority offered between $12 to $18 dollars an hour for unskilled labor, ranging from canning seafood to cleaning stables. Most of the 600-plus applications filed in the past few months sought landscape laborers, and one company in particular, Landscapes Unlimited, had filed 16 requests since May to bring in workers to maintain golf courses across the country. I called up Cesar Martinez, who oversees recruiting for Landscapes Unlimited, which is based in Lincoln, Nebraska. He said the company has been hiring guest workers for 15 years, and plans to get 200 workers this season through the visa program, which accounts for about 12 percent of the company’s workforce. Taking into account the visa fees and other costs, it would be cheaper to hire workers already in the United States, Martinez says, but he can’t find them, and doesn’t want to hire undocumented immigrants. “We’re competing with fast-food chains and retail stores, and [Americans] seem to find those jobs more appealing,” said Martinez, whose own father first came to the United States as part of California’s bracero program, the country’s first major experiment with a guest-worker program. Martinez explained the step-by-step process of hiring a foreign laborer, which takes about four months from start to finish and involves three federal agencies (and one state agency). First, he submits a request to the Department of Labor to calculate the most common wage for that particular job in that particular location. After getting a response three to four weeks later, Martinez sends a work order to the state’s workforce agency, detailing the positions he is looking to fill, the qualifications required, and the prevailing wage. For example, in May, he sent the Colorado Workforce Agency a work order saying that Landscapes Unlimited was looking to hire 16 people to cut and trim the greenery at a golf course in Breckenridge for $15.11 an hour. The next required step is to advertise the job, for 10 days, where the positions are located, and hire all qualified applicants. Then he sends information about his recruiting efforts to the Department of Labor and explains how many workers he still needs. Once he gets permission to bring in temporary workers, Martinez then applies for the workers’ H-2B visas through U.S. Citizenship and Immigration Services. (He says he ends up paying about $1,750 in processing fees per work order.) To get the visa, potential workers have to meet with staff from the U.S. Department of State at the closest American consulate in their home countries. During a two-day interview, each worker must pass a criminal background check. Though many U.S. businesses work with recruiting agencies in other countries to find laborers, Martinez and his staff prefer recruiting through references from current employees. They always send someone to Mexico to accompany workers to their interviews at the American consulates, though that is not required. That means they travel to Mexico a dozen times a year. How can all this be worth the effort (and cost)? Wouldn’t it be easier to find American employees, and cheaper in the long run, by paying higher wages? In Martinez’s view, that’s not an option: “We’re already paying double the federal minimum wage, and we have to stay competitive as a business,” he says.